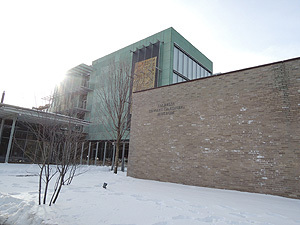 As part of a research project on General Research regarding the Utilization of Research on Cultural Properties, KAJIYA Kenji (Hiroshima City University) and UESAKI Sen (Keio University Art Center) were invited to attend a seminar on archives of modern art in Japan and the US on February 25th. Also present at the seminar was KIKKAWA Hideki, an Associate Fellow in the Department of Art Research, Archives, and Information Systems. 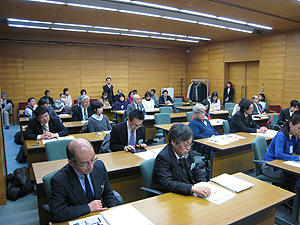 The seminar took place in the Institute’s seminar hall. The first portion of the seminar featured individual presentations. Citing the example of the letters of Clement GREENBERG, Mr. KAJIYA described his use of archival institutions in the US (such as the Smithsonian Institution’s Archives of American Art, the Getty Research Institute, and MoMA) from the perspective of an art historian. Mr. UESAKI used the Sogestsu Art Center’s database of ephemera to describe the thoughts of an archivist. Mr. KIKKAWA sought to provide an introduction to archive materials as a librarian by citing an example of notes made by the artist NAKAMURA Hiroshi. In the second portion of the seminar, a discussion took place based on the individual presentations that had been given. During the discussion, similarities and differences in how the presenters viewed archives from their individual perspectives became apparent. The Seminar had 95 attendees, which included personnel not affiliated with the Institute. Experts actively exchanged opinions during the event. The seminar provided a good opportunity to reconsider Archives that are Instrumental to Art Studies. As part of the Networking Core Centers for International Cooperation on Conservation of Cultural Heritage Project commissioned by the Agency for Cultural Affairs, Japan, the first session of training in conservation of wooden architecture took place in Mandalay and Innwa from February 4th to 12th. The training focused on wooden monastery buildings from the Konbaung Dynasty since these traditional buildings have yet to be adequately safeguarded in Myanmar. Training covered topics germane to proper conservation of those buildings, such as basic surveys, recording and sketching the building, and formulation of conservation management and restoration plans. Training is intended for young to mid-career staff of the Department of Archaeology and National Museum of the Ministry of Culture, Myanmar, and plans are to conduct 5 training sessions in total over a period of 3 years. The first training session had 11 trainees. After receiving basic lectures on architectural history, conservation history, and systems of protecting cultural properties, the trainees sketched and surveyed the layout of the Bagaya Monastery in Innwa as preliminary steps towards a building survey. Japan has amassed a wealth of expertise and experience conserving and restoring historic wooden structures, but Myanmar’s traditional building techniques and patterns have not been adequately studied. Many questions remain. How were ancient buildings designed and built and systems of measurement were used? 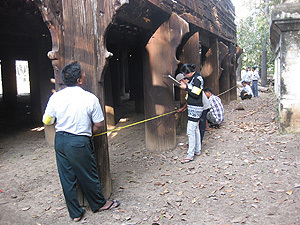 With these questions in mind, the training sessions seek to historically reappraise wooden architecture in Myanmar through surveys conducted with the trainees. The trainees are highly motivated, and they should gain needed expertise and insight through future training sessions. The Japan Center for International Cooperation in Conservation studies systems of safeguarding cultural properties in different countries. As part of this project, the Center continued with its study of the safeguarding of movable cultural properties in the US which it started last year. Although the US has world-renowned museums and art museums, it has no ministry or agency that safeguards and manages movable cultural properties. The national government is limited to a regulatory and oversight role. Studies from last year indicated that non-profit organizations in respective fields independently coordinate with relevant agencies in the US. In the event of a disaster or problem, multiple bodies appear to act efficiently and deal with the disaster or resolve the problem. The studies also revealed that routine management of movable cultural properties depends largely on the particular values of individual museums and art museums. From February 10–14, 2014, EMURA Tomoko and SAKAINO Asuka interviewed curators at the Harvard Art Museums and the Boston Museum of Fine Arts in further detail. In addition, we examined the substantial effect that an individual’s bequest can have on how a collection is managed at the Isabella Stewart Gardner Museum. 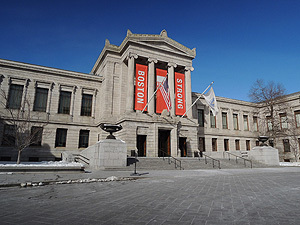 This study noted how the Boston Museum of Fine Arts in particular was established as a public institution through local initiative. Because of this background, the Museum of Fine Arts plays a valued role in the community. This fact also affects the values behind the management of the museum’s collection, as became apparent. The history behind the founding of an art museum or museum and the way in which it assembles its collection can affect its current management of cultural properties. Plans are to continue studying museums and art museums in the US with this thought in mind. The Japan Center for International Cooperation in Conservation (JCICC) has conducted training workshops on Documentation, Excavation, Conservation, and Site Management in the Kyrgyz Republic since 2011. This program was commissioned by the Agency for Cultural Affairs, Japan in order to safeguard the cultural heritage of Central Asia. From February 10 to 15, 2014, the JCICC jointly conducted its 6th workshop, a Training Workshop on Conservation of Excavated Objects, with the Institute of History and Cultural Heritage of the National Academy of Sciences, Kyrgyz Republic. 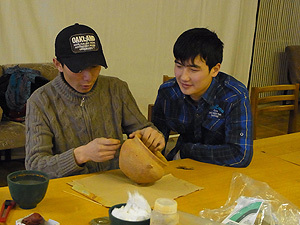 During the workshop, trainees brought in archeological objects that had been excavated in the Kyrgyz Republic. 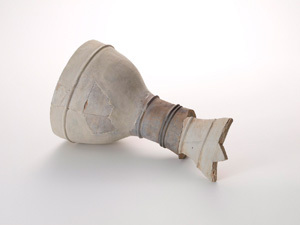 Guided by experts, the trainees conserved these objects. A new element was added to the workshop in which trainees practiced Creating Replicas of Archeological Objects. The 6th workshop was attended by 8 young Kirgiz experts who had attended all of the previous workshops. In addition, Professor Kubatbek TABALDIEV of Kyrgyzstan-Turkey Manas University brought students with him to observe the workshop. The workshop ended a great success. The JCICC plans to continue conducting various training workshops in the future in order to safeguard the cultural heritage of Central Asia. 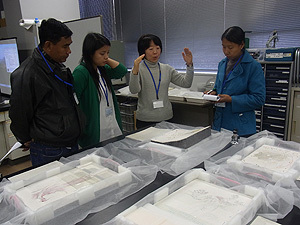 Three personnel from the Department of Archaeology and National Museum of the Ministry of Culture, Myanmar were invited to visit Japan from February 17 to 22. 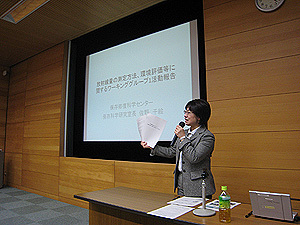 On the 18th, a seminar was held at the National Research Institute for Cultural Properties, Tokyo to follow-up on last year’s Seminar on the Current Situation of and Issues Concerning the Protection of Cultural Heritage in Myanmar. In addition, the visitors from Myanmar viewed different categories of cultural heritage in the Kanto and Kansai regions (such as buildings, artworks and handicrafts, historic sites, and districts for preservation of important traditional buildings). The visitors also heard from and talked with staff who are in charge of conservation and management of each site. During the Seminar, 3 representatives from Myanmar delivered presentations primarily on efforts to safeguard cultural heritage that they were involved in. The representatives described the progress of excavations and the state of site conservation in ancient Pyu cities, plans for site management of Beikthano-Myo and public education campaigns, and restoration and repair work at the Bagaya Monastery in Innwa, and the representatives also furnished a number of photographs. 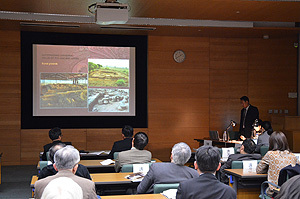 Representing Japan were 3 experts from the National Research Institute for Cultural Properties, Tokyo and Nara. The Japanese experts described the progress of cooperative projects between Japan and Myanmar and prospects for the future. The seminar also featured an active question-and-answer session. 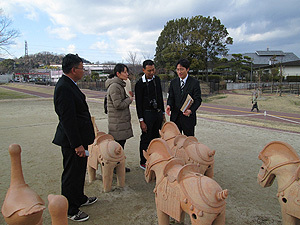 During their tour of cultural heritage facilities in Japan, the representatives from Myanmar visited the Tokyo National Museum, the Archaeological Park of Otsuka and Saikachido, the Yokohama History Museum, Ninna-ji Temple, Horyu-ji Temple, the Nara National Research Institute for Cultural Properties, the Site of Heijo Palace, the Miyama District for Preservation of Important Traditional Buildings in the City of Nantan, Kyoto Prefecture, the Imashirozuka Tomb and Museum of Ancient History, and Remains of the Shin-ike Haniwa (clay figure) Production Site. The visitors gained a better understanding of the current safeguarding of Japan’s cultural heritage.